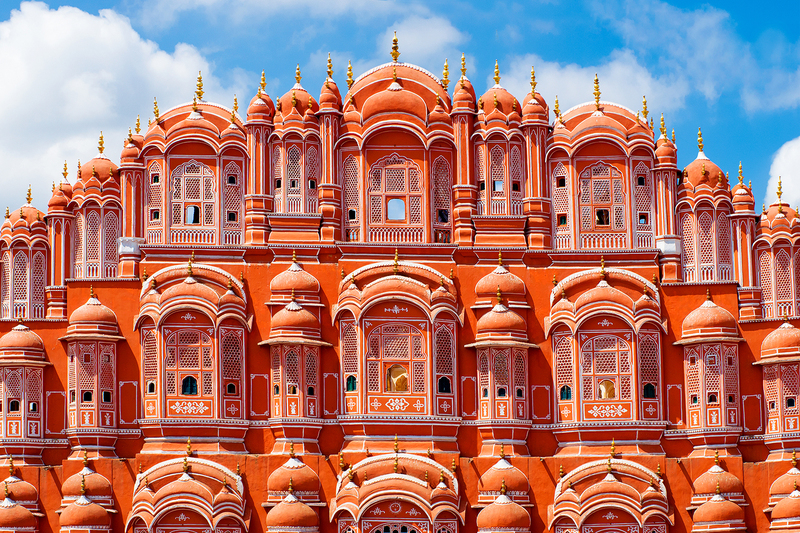 The city of Jaipur is world renowned for the skill of its artisans. And none are more revered than the gem-cutters of Jahri Bazaar. Here, within the hustle and bustle of the Pink City, gemstones undergo an amazing transformation. From rough material, to cut and polished jewels, join us as we uncover the history of gem cutting within the home of these skilled artisans. Paint the Town. . . Pink? Visitors to Jaipur may be astonished and overwhelmed by the vibrant and welcoming hues of the rich rose color found throughout the city. Within Indian culture, the dulcet tones of pink are symbolic of hospitality. The Pink City gained its moniker through an elaborate act of welcome. During the late 19th century, Maharaja Ram Singh had the city painted pink to welcome to illustrious guests. The Prince of Wales and Queen Victoria were touring the world at the time, and India was just one of their stops. To honor the event, and to keep alive the spirit of hospitality, the tradition was eventually written into law. Residents are now required by statute to maintain the pink color. The first planned city in India. Center of the gem cutting trade. Notably, Jaipur is the first city built in India as a result of meticulous planning. For any visitor to this place, the towering marvels of architecture, forts, and monuments are a testament to this foresight. The Raja of Amer, Sawai Jai Singh II, conceived Jaipur from months of planning, research, and design. Alongside his chief architect, Vidyadhar Bhattacharya, a clever grid model was thought out, based on ancient Hindu disciplines covering architecture, art, and craftsmanship. The completed city became renowned as an incredible architectural achievement. Jai Singh moved his capital from Amer to the completed city. Not only was Jaipur a planned project from an architectural perspective, but also from an artistic one. The Raja spent a great deal of effort in attracting the best and brightest to his new capital. Luring in scholars, artisans, and tradesmen of many types, he sought to build a true City of the Arts. With this wisdom, Raja Singh II created a center of culture as faceted as the jewels for which it would become famous. With over 300 years to build their expertise, who can come close to the famous lapidarists of Jaipur? Early on, many traders flocked to the city to sell their wares of gold, silver and precious gems to the ruling elite. However, the Raja and his court only purchased directly from the local jewelers who made the city their home. Also, through systems of patronage, the craftsmen of Jaipur received abundant opportunity to hone their skill over generations. Today, the Pink City is known as an important center of the gem trade. Daily, cutters can be seen at their craft among the many businesses and boutiques that make their home here. Of particular mention, the artisan gem-cutters of Jaipur are renowned for this skill with emeralds. Much of the material from Zambia makes it way to the skilled hands residing here. In addition to their skill at gem-cutting, the tradesmen of Jaipur are known for their skill with creating jewelry. 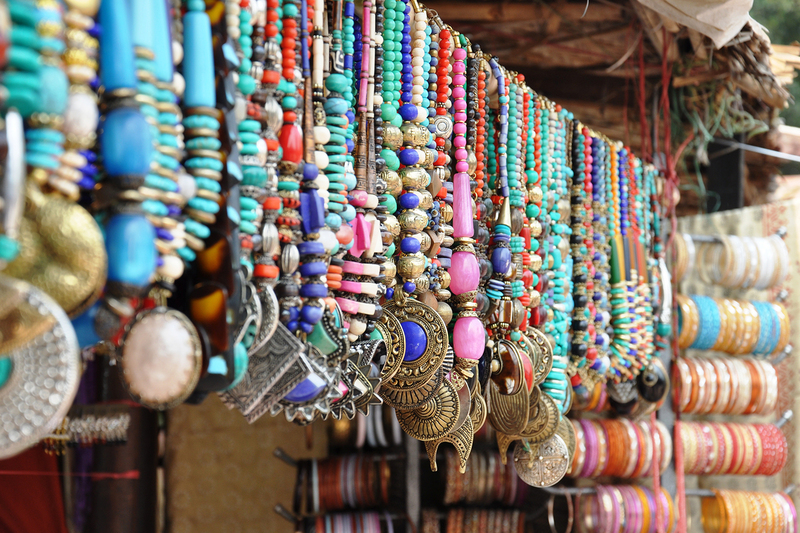 Drawing upon their rich culture and history, many kinds of uniquely beautiful traditional jewelry can be found in the many bazaars of the Pink City. Traditional styles include includes techniques such as the Jadau, Kundan, Meenakari and Thewa traditions. Each style is popular for its use in certain events, such as festivals or weddings. Of the many markets, or bazaars, found within Jaipur, the most famous is perhaps Johari Bazaar. Here rests the bulk of traders dealing in cut and polished gemstones. Johari Bazaar comprises over 400 individual stores and shops, with a variety of goods to match, based around gems and jewelry. Besides gems, the bazaar is also well-known for its jewelry and saris. A sari is a garment worn by women, typically draped over the body and cinched around the waist, though there are many ways to wear it. Despite this incredible variety of products, gemstones and jewelry lie at the heart of the bazaar. In particular, Kundan jewelry is a specialty here. Specialized craftsmen, known as ‘Kundan Saz,’ are the driving force behind this tradition of jewelry making.